If you are reading this I believe we already have something in common, I totally understand the need for time out and pampering! After almost 20 years working in media in London I took a different direction and followed my lifelong dream of working in the beauty industry. I studied at Champneys Beauty College in Tring whilst still working part-time in London and looking after a toddler. My hard work paid off and I achieved distinction. I opened the doors of my lovely home salon on 11th July 2017. When it came to selecting the brands for my salon I had only one skincare company in mind which was GUINOT – I had a course of Hydradermie facials before my wedding back in 2011 and I will never forget how amazing those treatments felt and how incredible my skin looked. It was also important for me to choose an established and proven brand and GUINOT ticked both of those boxes (for over 40 years). It is also an eco-friendly company, the active treatment ingredients are sourced from renewable plants, the products are not tested on animals and they do not contain parabens. For more information http://uk.guinot.com/the-guinot-salon-brand/unique-beauty-care-expertise/. 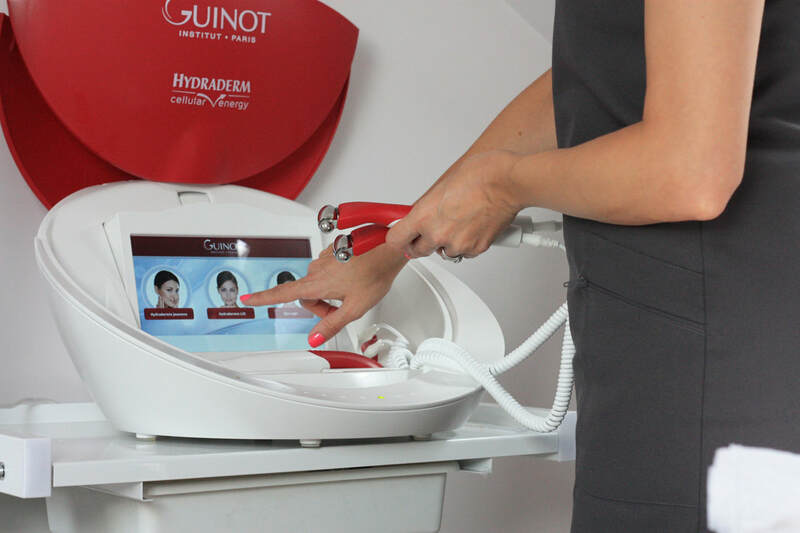 I've been intrigued by non-surgical facelifts and have now experienced the GUINOT Hydradermie Lift, which is a genuine alternative to Aesthetic Medicine acting immediately on signs of ageing and is proving to be one of the most popular treatments in my beauty salon. My aim with Helen Markham at Grove Beauty is to offer a beauty therapy experience in luxurious and personal surroundings that I myself have always wanted to receive; one that is professional and advisory yet friendly and personal, that delivers visible results yet is also pampering and enjoyable, and is offered by therapists who are passionate about what they do. At the age of 41 it is important for me to use techniques and products that will help keep me look radiant (and younger!) and I'm excited to be able to share my knowledge and passion to help others achieve the results – and relaxation – they require.